Sitting in what will eventually be a new taproom and event space, Nick Reistad explained the importance of making a 20,000-square-foot facility just as much of an experience for the Raised Grain Brewing consumer as it has been in the 4,000-square-foot space since the Milwaukee-area brewery opened in late 2015. 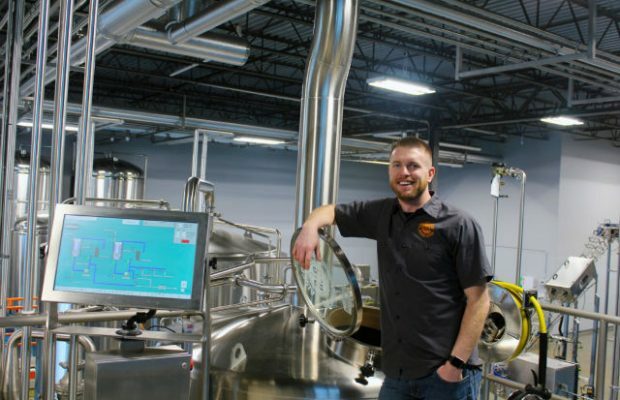 Growing up is hard work, but remembering how that growth happened — a local base of drinkers — got the Waukesha, Wisconsin brewery to go from a seven-barrel system to a brand new 20-barrel facility down the road in less than 18 months. That means being cognizant of the need to be branded. When a drinker comes in a beertender or other staff member can talk to them about the brewery’s beer. “We have all of them (beertenders) come through and spend the day brewing so they understand the process behind what they’re selling,” said Reistad, who is a co-founder of Raised Grain and the brewery’s business-minded marketing and sales manager. He, along with Kevin Brandenburg enlisted the help of homebrewers — and doctors — Jimmy Gosset and Scott Kelley. “They can tell you about their favorite beers, they can tell you about some of the stories of working in a startup craft brewery and just all the crazy stuff you see. Then you just have an awesome time getting to know our beertenders and we focus very intensely on that experience. Reistad had the business plan in his head, but no brewing experience. Gosset and Kelley had the home brewing experience, but no way to start the business. Brandenburg helped make the connection and around a year later, the quartet had Raised Grain opening its doors. The business plan for the brewery has taken many so many changes, Reistad said. “We started out small because it’s very capital intensive and we did what we did to be able to open up,” he said of starting with the seven-barrel system. “It’s also been really good from a flexibility standpoint because we can brew a lot of different styles, go through the beer really quickly and find out what we like. The five-year plan of growth hit in about 12 months, prompting discussions of what to do next. “At a scale this size there’s not really much left over after the taproom,” Reistad said while standing in the original brewery. “I think we were able to maintain about 50 accounts out of this place and they were all very patient because we’d run out of beer and we didn’t have anything to get them when they needed beer. Making 900 barrels in 2017 — and even less in 2016 — the quartet knew that expanding past the facility they were leasing was needed. The brewery had done the best it could as it grew, adding rows of small tanks while even adding a food truck out back to use as the brewery’s kitchen. Within a year of opening, the discussion for a new space was top-of-mind. A commercial broker who had been into the taproom and knew Kelley through his children said he knew of a building — a mattress warehouse — that was going on the market. “It’s got a cool window. It’s got a cool facade on the front and it’s just barren so we can do whatever we want to it, really easy,” Reistad recalled. The addition sees the brewery’s space go from 4,000 square feet to 20,000 square feet in a 50,000-square-foot building. To put that in perspective, the brewery’s new cooler — which they have dubbed “The Cooler of Optimism” is 13,000 square feet on its own. That meant a clean slate to build a workflow exactly how they wanted, which includes six 20-barrel tanks along with six more 60-barrel fermenters. “We learned very quickly this time around if you build too small you’re going to grow out of that, but that was always part of the plan,” Reistad said. “We just got there a lot quicker than we thought we would. The original brewery opened in about a year’s time, with a grand opening in December of 2015. The new production facility was purchased for $2.74M in May, 2017 and the first batch of beer was brewed in late December of the same year. It was a quick turnaround, and even quicker was the brewhouse production. After looking nationally and internationally, the Raised Grain team looked locally to KHS, which is located practically across the freeway from the original brewery and taproom. After seeing an ad for ProBrew’s canning line, a conversation started between to the two companies. ProBrew is located just down the road in New Berlin, Wisconsin, a fellow suburb of Milwaukee. Kelley checked out the facility one day and Reistad said he came back saying they had to work with ProBrew for the canning line. Raised Grain sourced all of its other equipment from someplace else but that fell through at the last minute, Reistad said. “We’re already in middle of summer (of 2017) and we’re out here meeting with Derek and his team talking about the canning line when we got the news that our timelines got pushed back,” he said. ProBrew said they could do the work in time. Craft beer in Milwaukee has blossomed, especially in the past three years. Raised Grain was one of the first to open in late 2015, followed by a swath of others in 2016. Yet Reistad said there is plenty of room for growth. “Had we opened up like four months later we would have gotten just a ton of publicity because 2016 saw so many openings,” he said. “We were in ‘15, so we just kind of got forgotten, which is fine. What also helped early on was nabbing a Great American Beer Festival gold with its Paradocs Imperial Red IPA. “Does it change what we’re doing at the end of the day. No. We know what we’re doing,” he said. “It’s just nice to have that help to sell the beer. Once. And then it’s up to us to sell it again. The bump up to a 20-barrel steam system from an electric seven-barrel was interesting as well Reistad noted, who admitted he intentionally took the day off for the first brew day on the new system. Even small things like going from a grain mill that took three minutes to a new mill that took just 31 seconds meant adjustments. “We had to adjust so that kicked things off on the wrong foot for the first brew and you know you just have all sorts of scaling issues where there’s the recipes, there’s the new equipment, then there’s the external warp coil around the calandria, that’s different than the electric system. How do you adjust the recipe? How does the boiler fit in? There are so many variables. He did note the customer service from ProBrew helped his team work through any problems. “They can adapt things so that you can brew the way you want to brew and that’s a partnership that we have,” Reistad said. “So yes, it was a huge learning curve but we had enough trust that they’re going where they’ve got it figured out. With the opening of the production facility, Raised Grain is adding cans to its portfolio. The addition will help reach new areas of sales and help expand past the taproom and into new markets, like greater Milwaukee and into other Wisconsin cities. “We looked at cans right away but the scale that we were at before didn’t make sense to have any sort of canning line or even a mobile canning operation to come and do anything,” Reistad said. “It just didn’t make sense from a volume standpoint or an economic standpoint. At the time, bombers fit. We didn’t have to invest in equipment that we would never see a return on for that scale. So bombers just made sense. Building the brand through can art is complicated noted Reistad. When it comes to branding the Raised Grain product, Reistad brought up consumer experience over and over. “It starts in the taproom where you have this really cool experience that people can have and then as you start to expand your range, how do you maintain that same spirit,” he asked. “We try to give each of the beers its own story because if you come into the taproom you get stories. You get to hear about the one time that I blew up a barrel (no one got hurt) or any story about any of the funny things that go on in a brewery. Right now the future means building the brand and letting it grow while getting all the infrastructure in place so that when Raised Grain catches up to itself, then they’re in a good spot. “We can weather some storms,” Reistad said. “I think if you continue to have a super high-quality product and a really great brand — I think we’re both — you’ll be and a good spot. Reistad also noted that Raised Grain must focus on their home market of Waukesha and Milwaukee first. But moving forward – and with all four being University of Wisconsin-Madison grads — a move into the state capital is important as well. “There’s a lot of beer consumed in Madison, speaking from the fuzzy memories I do have of going there,” Reistad joked. “We’d love to get there. But we have to see it from a distribution standpoint, a production standpoint and you don’t want to grow beyond what you can maintain, because that’s where the bad experiences come in.